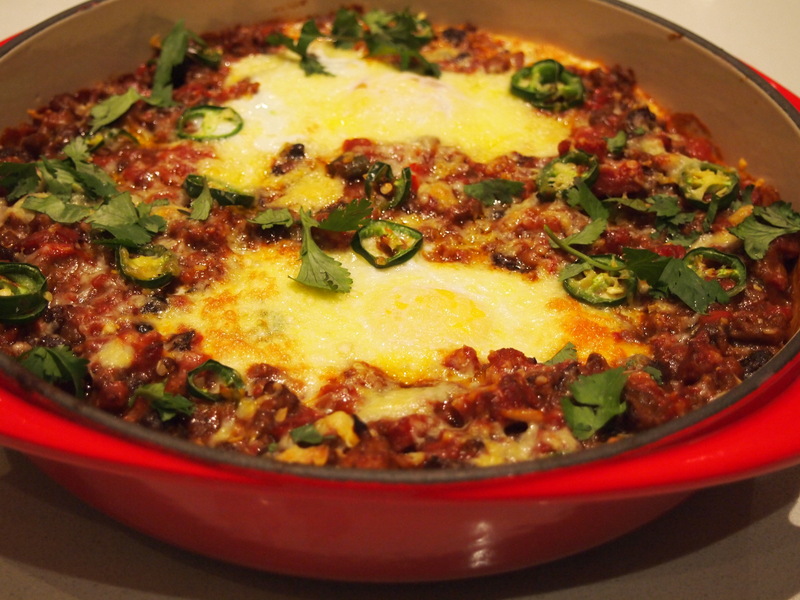 The inspiration for this recipe comes from the popular Mexican breakfast, Huevos Rancheros. As I was serving this for dinner I wanted to make the vehicle for carrying the eggs more substantial than the traditional tomato sauce used in Huevos Rancheros. 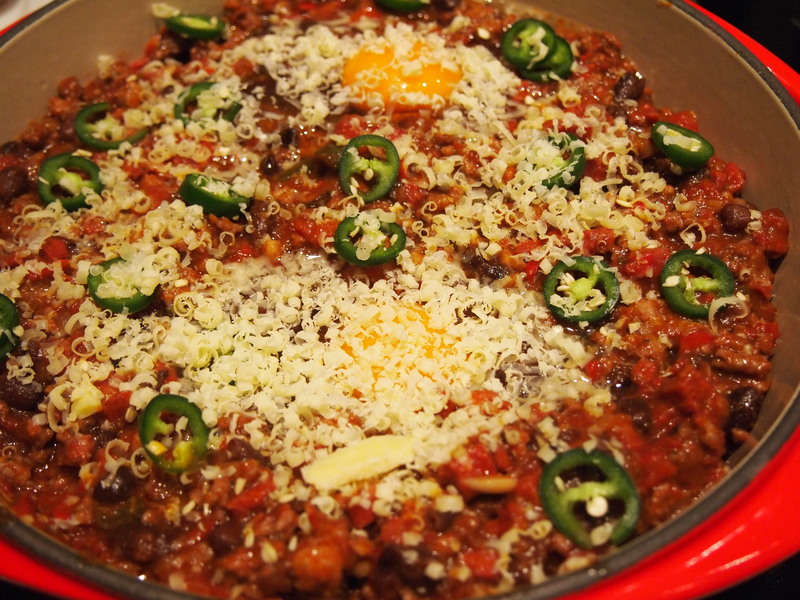 I thought a spicy sausage and black bean chilli would work well with the eggs, and it did. Be careful not to over bake the eggs, you want the yolks to be soft and runny when pierced. I served it was sour cream, tortilla and corn chips. This was a knockout dish and something I’ll be making again, soon! Heat some olive oil in a large frypan over medium heat. 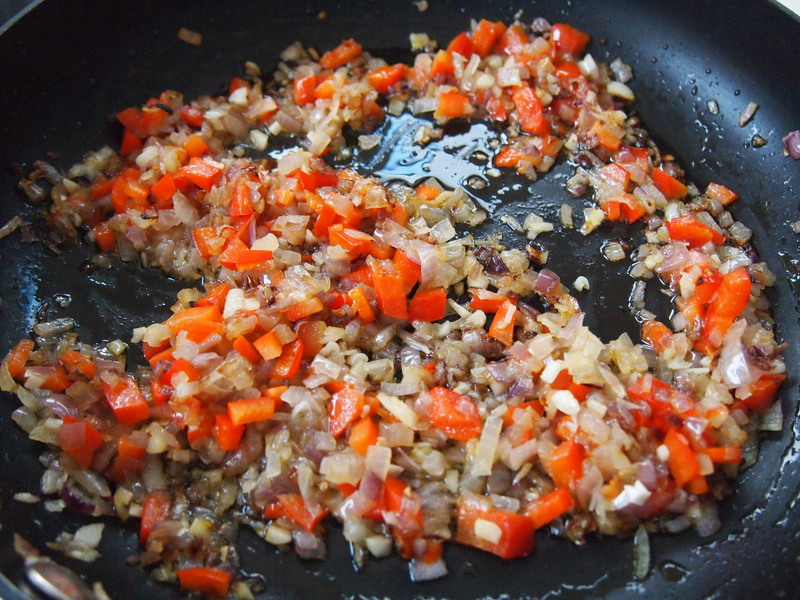 Add the onions, garlic and capsicum and cook for about 8-10 minutes until softened and starting to golden. Add the cumin, paprika and chipotle peppers and cook for a further 2 minutes. 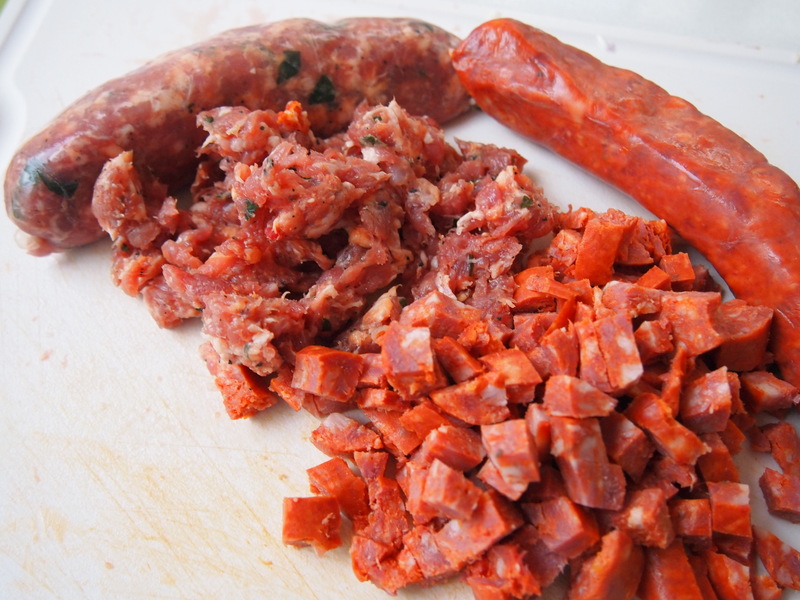 Take the pork sausages out of their casing and crumble coarsely and dice the Chorizo. 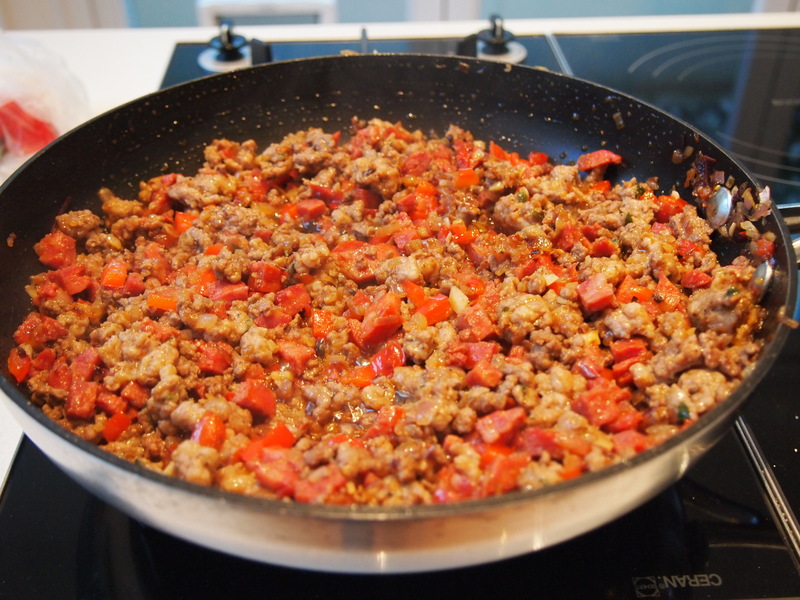 Add the sausages and the ground meat to the pan and cook, breaking up the meat with a wooden spoon until the meat has all changed colour and is starting to brown. Season with salt and add canned tomatoes, black beans and 1 can of water. Bring to the boil, lower the heat and simmer covered for 45 minutes, checking and stirring every now and then to ensure that it’s not catching. If the pan is running too dry add some more water. After 45 minutes, remove the lid and continue to simmer, uncovered for another 15 minutes or until the chilli has thickened. Preheat oven to 180C. 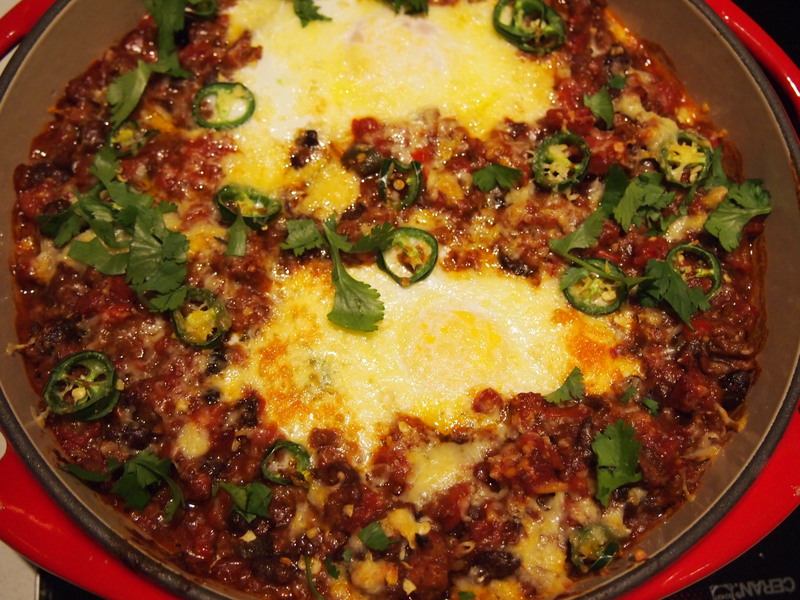 Transfer the chilli to a shallow sided baking dish and make a well in the chilli for each egg. Carefully crack the egg into each cavity. Sprinkle with cheddar cheese and sliced green chilli and bake for 15 minutes or until the eggs have just cooked through. Remove from the oven and sprinkle with coriander leaves. Serve with sour cream, tortillas and corn chips.